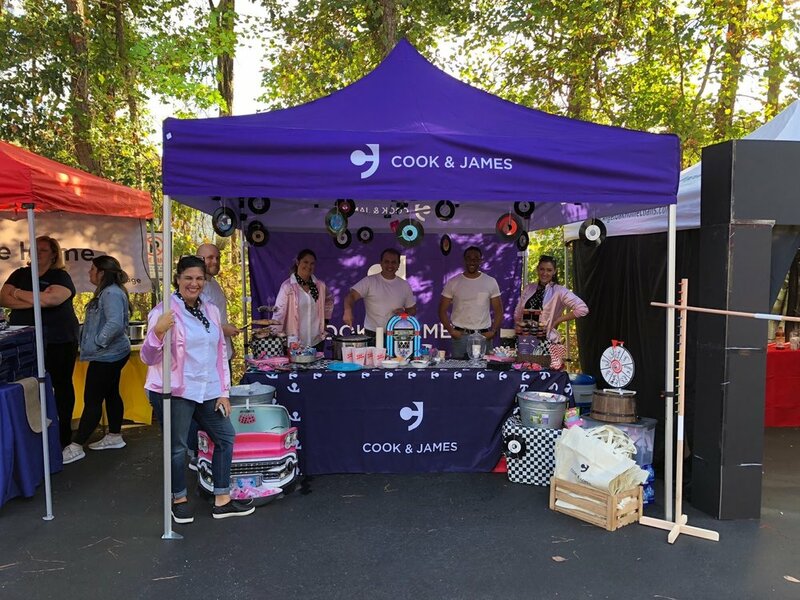 Cook & James attended the Annual Chili Cook Off last month, hosted by the Atlanta REALTORS® Association. We had loads of fun and are excited to share our event experience with our readers! After arriving at our designated table and setting up our huge purple Cook & James tent, we realized that we had quite a lot of decorating to do! We wondered where to even begin. Marketing Manager, Mary Jackson, began categorizing the supplies as we adjusted and re-adjusted the table cloth in accordance with the gusts of wind working against us. The next hour was a frenzy of collaborative arrangement and preparation for the fun night ahead. Where should the drinks go? How do we get our prize wheel to spin properly? Who’s bringing more ice? And, my personal favorite, why do we have so much ice? The team pulled it all together in time to present our Pink Ladies themed tent full of exciting games and treats reminiscent of the good ol’ days. From ring pops to Fun Dip--Cook & James hit it home with childhood memories. Hostess and Little Debbie cake snacks rested atop cake stands made out of old records. We strung records together and hung them from the tent’s ceiling (which required lots of trial-and-error to achieve--there’s more than one way to skin a cat!). Our miniature jukebox played songs from the Grease soundtrack among other classics, pulling together our theme. All that hard work and preparation paid off! Cook & James was proud to receive the Best Booth award for our Pink Ladies booth! Pictured above, co-founder Kara Cook and the Cook & James team showcase our award in the glow of the jukebox and dangling records. We were up against some tough competition, but we swing for the fences in everything we do. From our Limbo stick and prize wheel to our Greaser (and Grease-ette) outfits, we brought the heat this year. Speaking of heat, associate attorney Chuck Biskobing cooked our theme-fitting and delicious Cherry Coke Chili--sweet with a little kick! It was a huge hit and paired perfectly with Mary’s special Cherry Coke and Orange Creamsicle Jell-O shots. Whether the attendees were coming for the chili, the Jell-O shots, or the candy, there was something for everyone! Pictured above, Deanne Golden, President-Elect of the Atlanta Board of Realtors, enjoyed hanging out with the Cook & James Pink Ladies and Greasers, and we enjoyed her company which kept us full of laughs! Event attendees could use the Cook and James SnapChat filters created for the event-- what a hit! At Cook & James, we strive to push our creative limits to create the best and most fun experiences from our at-home closings to our industry events. Kara, Mary, and Chuck had a blast taking snaps with our ‘Honorary Pink Lady’ filter. Check out those sunglasses! Throughout the night, we collected business cards from the attendees for a special drawing to receive a 55-inch Roku TV from Cook & James. The marketing team happily presented the television to winner Victor Salerno, owner/broker of RE/MAX Paramount Properties in Alpharetta. Thank you to all who participated in the drawing! We thank the Atlanta REALTORS® Association for hosting their Annual Chili Cook Off and all the attendees for coming together to make this event so fun and memorable. We look forward to next year’s cook off!